Don’t wanna miss when we launch on Kickstarter? Click here! What is BARPIG: After Hours? Legend tells of a tavern called BARPIG, a place deep in the woods where adventuring pigs go to challenge themselves and be reigned piggy supreme. However, not everyone is allowed in the illustrious BARPIG tavern, and some aren’t too happy about it. So when the good pigs are away, the bad pigs break in to play. 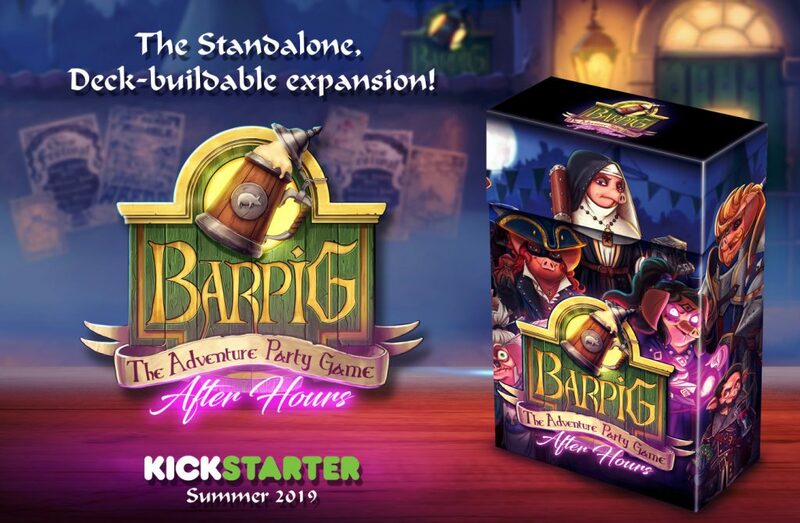 Get ready to align yourself towards villainous intent with BARPIG: After Hours, the highly anticipated sequel to BARPIG – The Adventure Party Game. Played standalone or as a fully modular expansion for the original game, After Hours features 10 brand new devilish characters each with their own unique challenge. Come and meet the Meadium, evil step-sister of the Pourceror, or brave combat with the Barzerker, strongest in the land! These new characters come combined with an new assortment of malignantly dishonorable items to back-stab your fellow players. Suitable for groups of 3 to 7 players, BARPIG: After Hours will have you and your friends laughing out loud in deliciously vindictive villainy in this new fight for piggy supremacy. Amazing! When do you launch? We’re going to go big this time round! After last year’s incredibly successful UKGE debut, we’re returning this year to launch our Kickstarter Live at UKGE 2019! So come join us in our BARPIG Tavern (Stand 1-691) on Friday May 31st at 4:00pm for our Live Kickstarter launch and party. Full details will be published here as well as on our Facebook page, so be sure to follow us to always get the latest information! What about these New Characters you’ve been revealing each week? Each week on Monday leading up to our launch we’ll be challenging you to guess who our new Characters are! Follow our Twitter and/or Instagram to get an exclusive sneak peak at who’s lurking in the shadows behind our original BARPIG characters. We’ll even give hints as to how they know the original Character to help you guess! Then on Friday we’ll reveal the sneaky interloper as well as their character card in the game! If you follow us on Facebook to get the full background story with each reveal. Introducing the BARPIG: After Hours usual suspects! If you don’t tick this box, we can’t send you information about our campaign launch! You can change your mind at any time by clicking the unsubscribe link in the footer of any email you receive or by contacting us at info@barpig.eu. We will treat your information with respect. For more information about our privacy practices please click here.